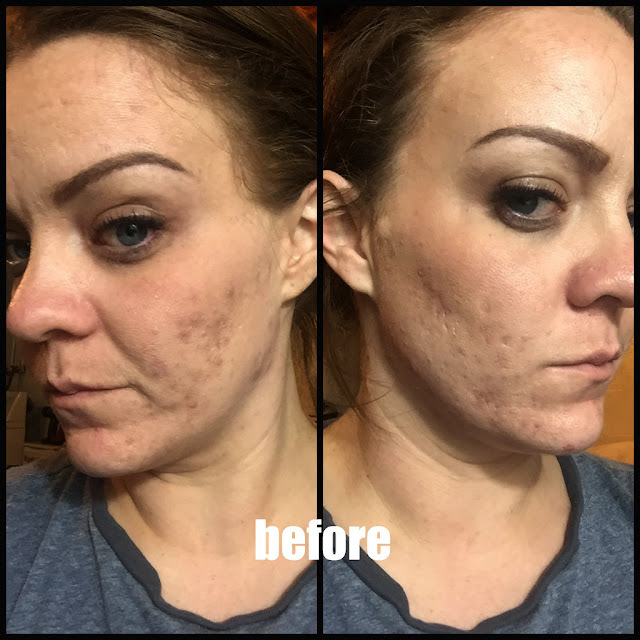 Ok, so I have a pretty cool discovery in the beauty world! 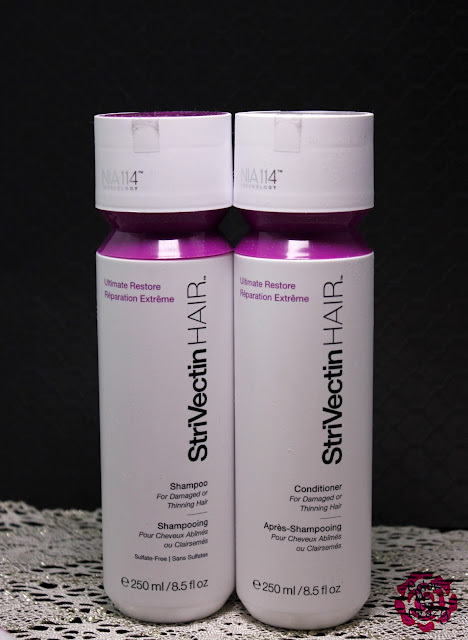 StriVectin just came out with a line of hair care and it's awesome! Do you remember all of those really great products with their NIA-114 "potion" in it? Well, this hairline has it in it, too. Do you know what that means? 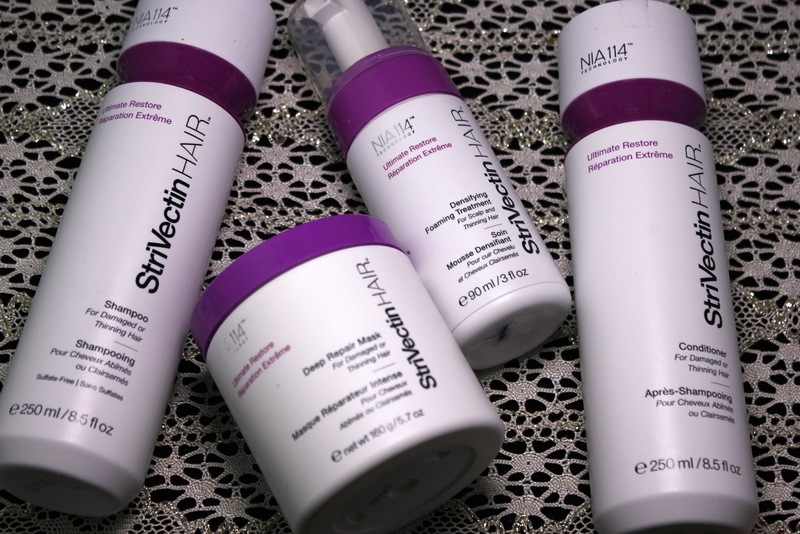 Anti-aging for your hair!!!! I mean, come on... how cool is that? 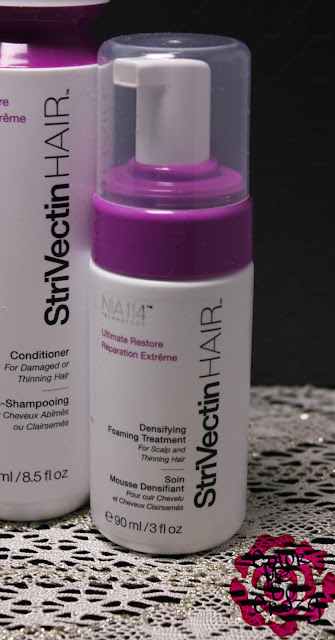 I am trying the Ultimate Restore Collection that is for damaged or thinning hair. 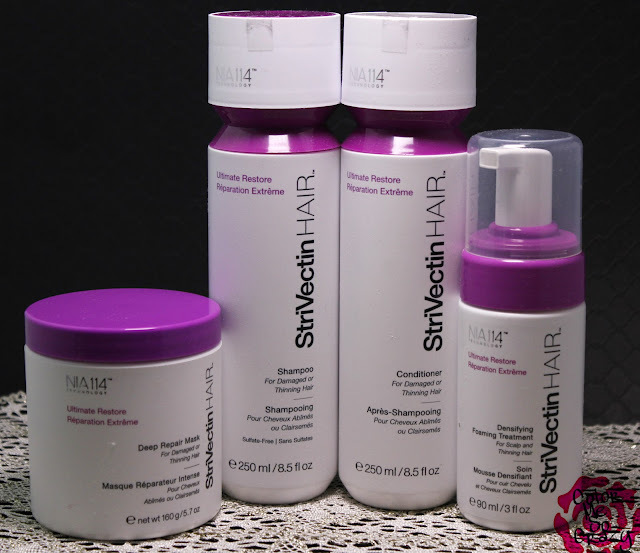 It is supposed to reduce breakage, while deeply nourishing your hair from root to tip while transforming the damaged strands. The shampoo and conditioner duo were actually really nice. I was kind of expecting a medicinal smell but they had a pleasant scent to them. I do wish the shampoo had more lather and bubbling action. I like all those suds. Both of these are designed to help improve strength, minimize breakage, give nourishment. The conditioner also targets the hair cuticle and helps prevent against future damage. I liked how the conditioner feels. It really kept my hair feeling soft between washing. These are $25 each at Sephora. The Deep Repair Mask also has the same goals as the shampoo and conditioner set. It helps to repair hair starting at the scalp. It gets to the damage on a deeper level than your regular conditioner and keeps your hair protected longer. I used this once every week or when I shower at home (I'm a gym rat and shower at the gym just about every day). The Deep Repair Mask is $39 at Sephora. The Densifying Foaming Treatment is the last step in this regiment. This is my favorite part of this entire collection. This is a super unique product and I am excited about what's it's doing to my hair. You use one or two pumps to massage onto your scalp. The directions say you can use it with dry or damp hair, but I've only tried damp. This strengthens that hair from the root to reduce loss, breakage and helps create an environment to produce new hair growth. While I'm not losing hair, my hair doesn't have the volume it used to. After using this for several weeks, my hair has umpf again! The volume at the roots has increased. The Foaming Treatment is $44 at Sephora. This entire line is free from sulfates, papabens, phthalates, phosphates, and synthetic dyes. They are safe to use on chemically treated and dyed hair. They are available at Sephora.com and Ulta.com. There are also two other lines- Max Volume and Color Care. They both have the same great care for you hair but target fine hair and color processed hair in that order. If you are looking to try a new line, Sephora has a little trio for $32 that includes the Shampoo, Conditioner and Deep Repair Mask. It's totally worth trying out for $32 to see if you like it. I've been loving their entire NIA-114 line and just about everything that comes from it. While the products are a little pricey, the outcome is totally worth it.